We are planning an awesome tour this year,spanning June 5th through 11th 2018, with a day in Darwin before heading for 2 days in Kakadu, staying at the Mercure Crocodile Kakadu hotel, and then on to Barunga for 3 days of the festival. Back to Darwin on Monday and then half a day shopping in Darwin before you head back home or wherever else you have planned. Keep up to date by joining our mailing list and we will keep you posted as things develop. Costs are estimated to be around the same at around $2855 per person twin share staying at 4 star accommodation in Darwin and Kakadu and camping at Barunga, because there are no hotels where we are going. way to Ubirr to see some amazing 20,000 year-old art and enjoy the sunset. Then to dinner and a good rest The Mercure Crocodile Kakadu Hotel at Jabiru. Friday June 7th – Early rise and a breakfast boat cruise on the Yellow Water Billabong, where you may see crocodiles close-up, as well as other flora and fauna unique to the area. Then experience the Warradjan Aboriginal Cultural Centre before enjoying a buffet lunch at Cooinda. 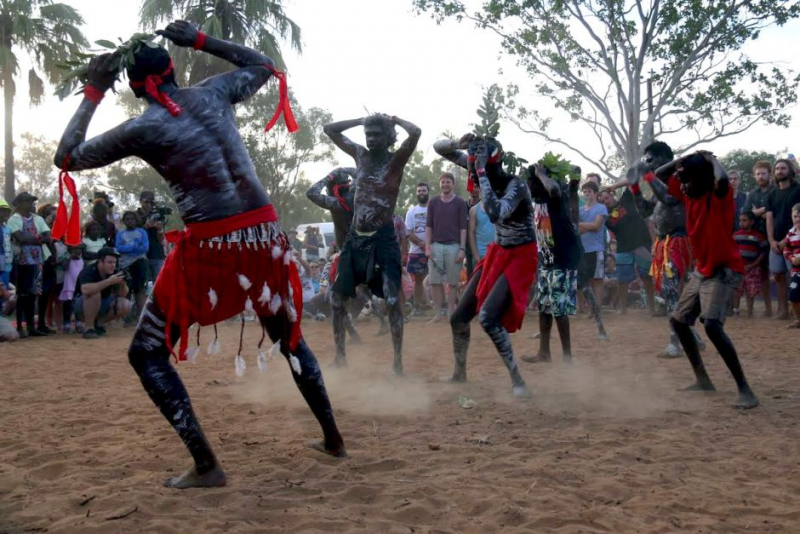 Then we head down to Barunga Festival, pitch tents and begin out 3-day camping in the midst of Aboriginal dance and music culture. Monday June 10th – Break camp and head the 400KM back to Darwin from Barunga, stopping at Hayes Creek Roadhouse for lunch and back to the hotel to freshen up and relax before dinner at Seafood on Cullen buffet restaurant. Tuesday June 11th – Breakfast at your hotel and free time to wander and shop. Airport transfers and head off on your continuing adventure, or home, whichever you have chosen to do. All that for a smidgeon over $400 a day including 3 nights of 4 star accommodation, a dinner cruise valued at over $100, a breakfast cruise valued around $100. Meals actually totalling about $400 in value This promises to be an event-filled cultural experience and adventure of a life-time. We promise to help you enjoy your stay in the Northern Territory to the max! Download the Barunga Festival and Outback Adventure PDF information brochure here or contact us via one of the links above and request one by mail. Please contact us for more information using one of the mediums at the top of the page behind all those social media icons. There’s a phone number and an email address as well, for those who prefer the personal approach, like I do. Or you can join our mailing list to receive updates.